Create Java programs for the following two problems. 1. Write a Java application to display the following GUI. At this point you are only implementing the display. We are not ready to make the calculator actually do any calculations! 1. The size of the calculator is 250 x 250 pixels. 2. 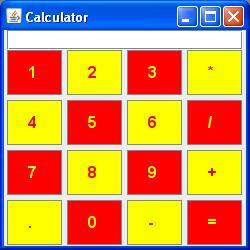 The background and foreground color of the calculator buttons must alternate in a checker board pattern as shown above. You can choose any pair of colors for your foreground and background colors. 3. The buttons should have at least 5 pixels of space between them. 4. The text on the buttons should be SanSerif size 16 and be bold. 5. Your application should be implemented in a single class. The main method of the class does nothing more than create an object of the class. The constructor of the class creates and displays the GUI. The constructor may call other methods of the class if needed. You can specify the title of the window in your constructor by simply adding the following line as the first thing in your constructor. 2. Write a Java application to display the following GUI. At this point you are only implementing the display. 1. The textfield should accommodate 3 characters. 2. The V1 and V2 labels should be next to the corresponding textfields. Hint: Put each label and its adjacent text field into a panel, then put both panels into another panel! 3. The buttons should have 10 pixels horizontal spacing and 5 pixels vertical spacing. 4. For the layout of the JFrame, use FlowLayout( FlowLayout.CENTER, 10, 5). 6. Do not use inheritance for this program. Use a JFrame member variable as the main window object for this program. Take screen shots of the output of programs 1 & 2. Paste the screen shots and your source code for your programs into a Word document. Screen shot of problem 1. Code for probem 1. Screen shot of problem 2. Code for problem 2.
i need to have black and white calculator. not this one. please check another version of this lab. See if that works for you. otherwise contact me on support@iqrajavaid.com and share you requirements.